The One Year Countdown to the Lima 2019 Pan American Games has officially begun as the greatest sporting event of the Americas prepares for its return in the Peruvian capital of Lima. Pan American Sports Organization President Neven Ilic says that organizers of the Lima 2019 Pan Am and Parapan Am Games are fulfilling their commitments on time to give the top athletes of the Americas the best experience possible at the Games. LIMA, PERU (July 26, 2018) – Exactly one year from today, the top athletes from throughout the Americas will reignite the continent’s passion for sport at the Opening Ceremony of the Lima 2019 Pan American Games. On July 26, 2019, more than 6,900 athletes will proudly enter the National Stadium of Peru to represent the 41 countries of the Panam Sports family. Seventeen days of world-class competition will follow as the athletes battle for the top of the podium and the chance to qualify for the Tokyo 2020 Summer Olympics. The Lima 2019 Pan American Games will offer an unprecedented amount of 39 sports, featuring a record-breaking 22 disciplines that will serve as qualifiers to Tokyo 2020, including the new additions to the Olympic program of karate, surfing and skateboarding. “We look forward to welcoming all of the Panam Sports family next year for what we know will be a memorable event for all those involved,” said Lima 2019 President, Carlos Neuhaus. As the One Year Countdown officially begins, the Lima 2019 Organizing Committee (COPAL) is working harder than ever to make Americas’ greatest sporting festival a reality. In terms of sports infrastructure, rapid progress continues to be made in the construction of the Athlete Village as well as at the VIDENA sports complex that will host 10 sports during the Pan Am Games. COPAL estimates that 95 percent of all construction projects will be completed by March 2019. To mark the One Year Countdown to Lima 2019, construction firm Besco-Besalco completed the final tower of the Athlete Village today, with all seven now ready to be transformed into comfortable and accessible living space for all athletes and para-athletes. Lima 2019 is also preparing to leave a great cultural and sporting legacy for all of Peru. COPAL President Carlos Neuhaus says that the Lima 2019 Pan Am Games will serve as a “before and after” for Peruvian sport, with great sports development expected from hosting Americas’ Games. The power of sport to bring people together was on full display on Sunday, July 22 in Lima’s Historic Center and the iconic Plaza de Armas. The event brought together hundreds of excited Peruvians featured Peru’s top athletes, sport demonstrations and the lighting of the Countdown Clock marking the number of days until the biggest sports festival to ever take place in Peru begins. “It seems incredible to us that we are only one year away from this great Pan American sports festival and at the same time it’s not without its challenges,” said Panam Sports President, Neven Ilic. “Lima is working very well and they have fulfilled all the goals that we set for them when we were together. I think that, in such a big and important event, the work that we are doing together will allow us to have successful Games. While Lima is doing very well, there are many areas that we have to take great care and watch over, in order to ensure that there are no shortages in transportation, food, comfort, the sports facilities and the Athlete Village. I am more optimistic every day. I think things are going well, the commitments are being fulfilled and I know that next July we will deliver the Games that the athletes in our region deserve,” Ilic concluded. “Today I want all of the Americas to celebrate this important milestone on our journey to hosting captivating Games in 2019. Exactly one year from now, Peru will stage the largest event in its history, featuring the best athletes from the continent in what will surely be one of the best Pan American and Parapan American Games ever,” said Lima 2019 President, Carlos Neuhaus. 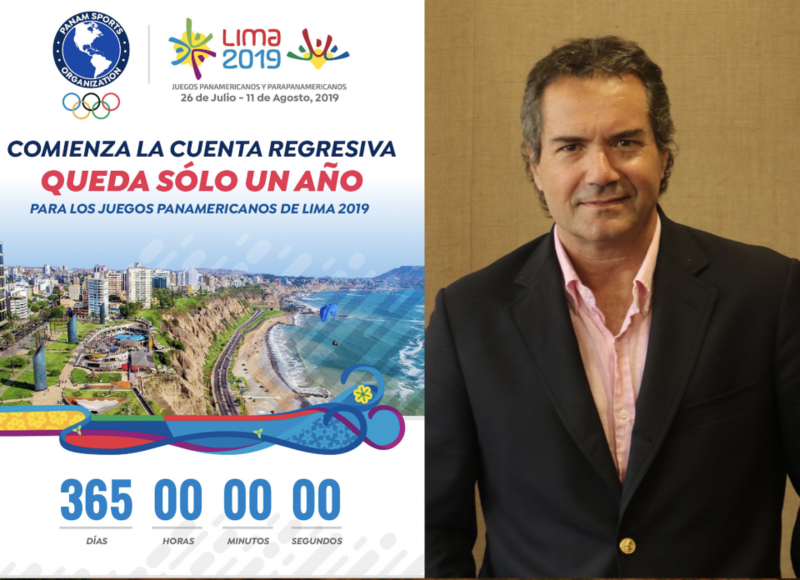 Panam Sports President Neven Ilic hopes all of Americas’ athletes will join in the celebration of the One Year Countdown and invites them all to compete in Lima next July. View President Ilic’s video invitation to the athletes below. The Lima 2019 Pan American Games will be held from July 26 to August 11, 2019, followed by the Parapan American Games from August 21 to September 1, 2019. The XVIII Pan American Games of Lima 2019 will welcome the 41 National Olympic Committees of the Panam Sports (formerly Pan American Sports Organization – ODEPA) family and their 6,664 athletes who will compete in 39 sports and 62 disciplines between July 26 and August 11, 2019. Likewise, the Parapan American Games will bring together 1,890 athletes who will participate in 17 sports and 18 disciplines, between August 23 and September 1. Lima 2019 will be a qualifying event for the Tokyo 2020 Olympic and Paralympic Games, which guarantees the presence of the best athletes of the Americas. The Pan American Games are the largest international multisport event in which athletes from the Americas participate. The competition is held for Americas’ best athletes athletes every four years during the year preceding the Olympic Games. Since 2007, the city that is chosen to host the Pan American Games also organizes the Parapan American Games for athletes with different abilities. The Parapan Am Games are held immediately after the completion of their respective Pan American Games.